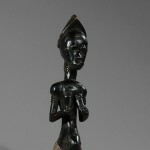 For the Baule, every successful sculpted figure necessarily conveys a sense of individuality, as in the approbation “o fa sran!”–“it resembles a person!” Whether carved to represent one’s otherworld mate – the “otherworld woman” (blolo bla) of a man, or the “otherworld man” (blolo bian) of a woman – or a bush-spirit familiar, the sculpted Baule figure is a stand-in interlocutor for an unseen spirit. 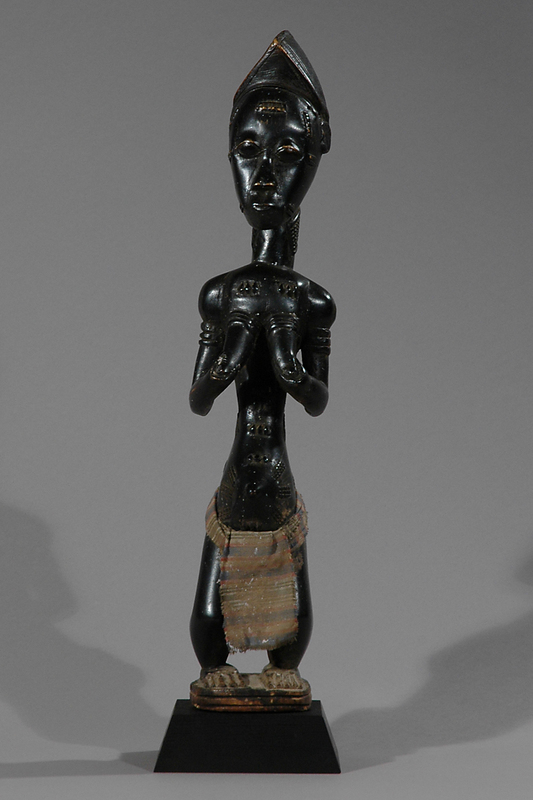 A Baule man probably commissioned this female figure as a portrayal of his otherworld woman, following the instructions of a diviner and his revelation that the particular problem the man faced stemmed from the jealousy of his neglected mate in the otherworld. 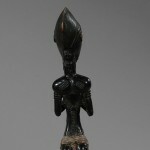 To picture her identity and also to ultimately please her, the sculptor set out to carve a person of beauty as perceived by Baule notions of attractiveness. 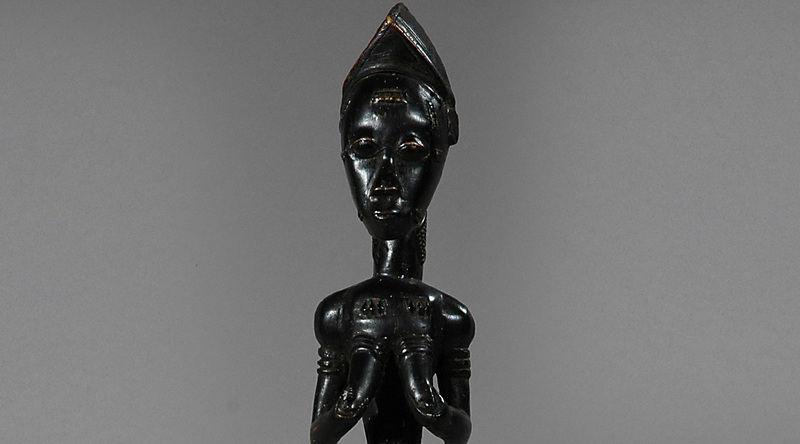 She is depicted with serenity and composure: her flexed legs, her hands supporting both breasts, her downward gaze-all impart a sense of a person who is still, quiet and potentially responsive. Her beauty is revealed in her ample calves, her rounded buttocks, the swelling curve of her distended ‘top abdomen’, the fullness and potential of her pelvic circle (accentuated by hip beads), her high breasts, her long elegant neck, and the symmetry and perfection of her facial features. 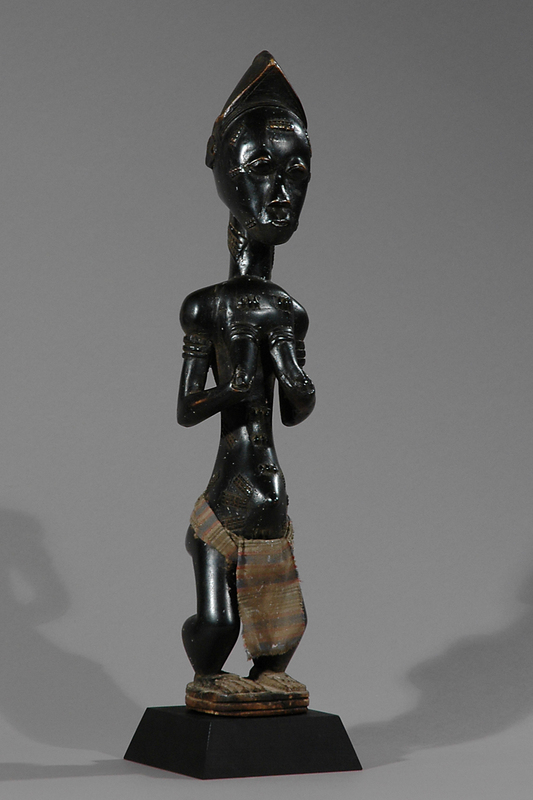 Beauty, for the Baule, is also seen in the depiction of scarification–the raised keloids which give the body a culturally imposed, tactile texture that speaks to her individuality while also evoking that betwixt-and-between status of youthfulness when, free from childhood yet not constrained with the responsibilities of adult status, one explores and enjoys physical maturity. 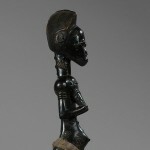 This figure also bears witness to its former owner. It was he who added the miniature loincloth. Her lustrous surface is due to the frequency with which he held her and addressed her on the mornings after the nights set apart for the dream visits from his otherworld mate. 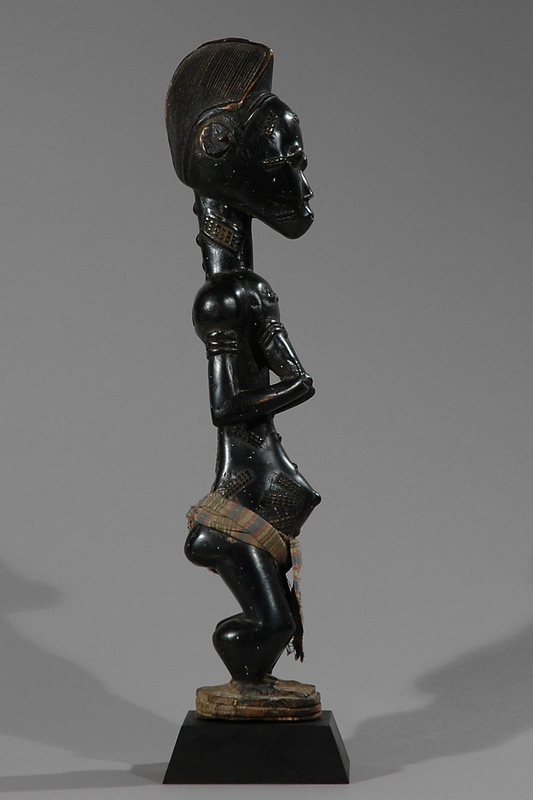 The figure concretized his waking dreams and made possible his daytime reveries. 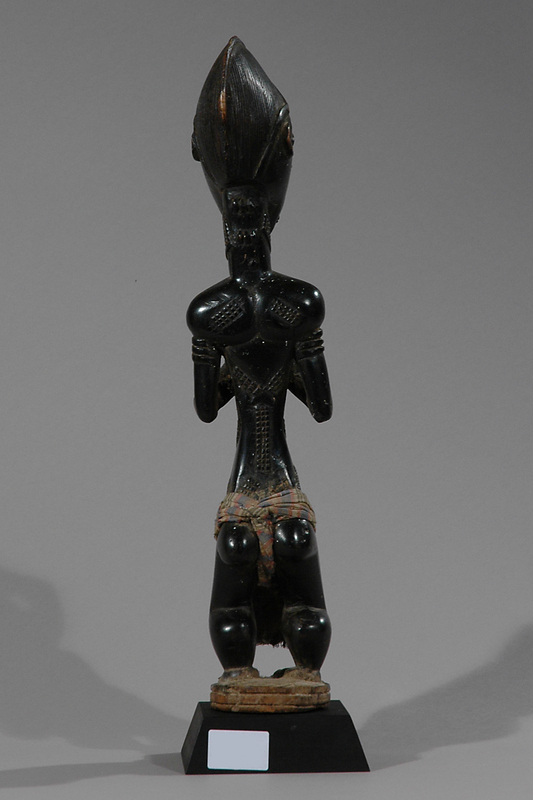 (This description is taken from a very similar Baule female figure on display at Smitsonian National Museum of African Art). 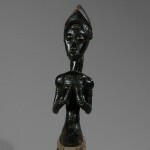 Literature: P. L. Ravenhill: Baule Statuary Art: Meaning and Modernization, Institute for the Study of Human Issues, Working Paper 5 (Philadelphia, 1980)S. M. Vogel: Beauty in the Eyes of the Baule: Aesthetics and Cultural Values, Institute for the Study of Human Issues, Working Paper 6 (Philadelphia,1980)S. M. Vogel, Baule, African Art, Western Eyes. 1997.